Step 1: To make the floral antler decoration first paint your antler white. Step 2: Once the white paint is dry, dip the tips of the antler into bright gold paint. Step 3: When the gold paint is dry, take small vases and attach it to the antler using your pink cotton or string as shown in the image below. 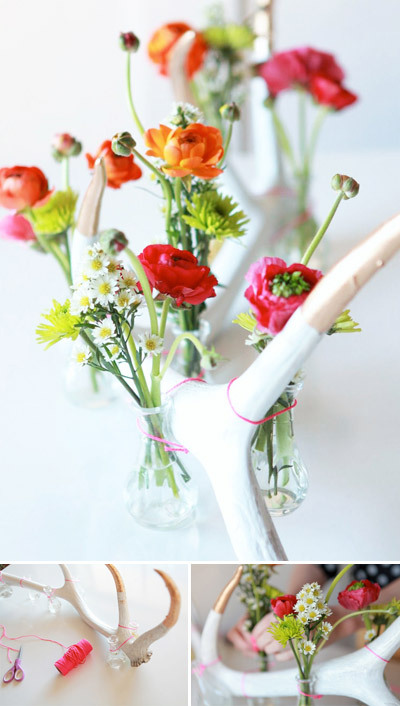 Step 4: Once your small vases are neatly in place, fill the vases with spring flowers.